This is the 7th post about our bathroom remodel. For more information about each step of this process, click here. 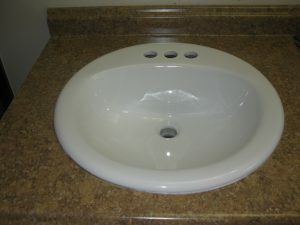 After a long stretch of not having a sink in the bathroom, we were excited to build and install the sink cabinet. Once that was finished, we could install the new countertop, sink and faucet and be ready for a full-service bathroom again. 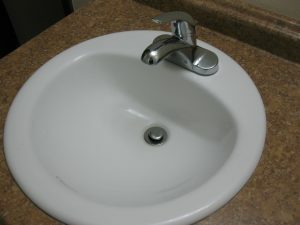 It is amazing how dependent we are on our modern bathroom conveniences! We decided to build a sink cabinet because of two main factors: 1) we could not find the particular cabinet layout we wanted in a ready-made form; and 2) the price of the quality-built cabinets was too high (even at our local cabinet wholesaler). For the layout of the cabinet, we wanted three spaces underneath. The left side of the cabinet needed to be a two-door space under the sink that could house cleaning items. Next to that we needed a 3-drawer section. On the right side of the cabinet, we planned a concealed, pull-out hamper. To ensure the countertop would fit our cabinet design, we researched the standard sizes of counter – both kitchen (25 inches) and bath (21 inches). Since bath counters are not as deep, we chose to buy a kitchen counter from Home Depot and build our sink cabinet to fit it. For material of the cabinet, we chose Baltic birch plywood. Here is a picture of the basic structure of the 3-part cabinet design installed and painted with semi-gloss paint for easier clean-up. 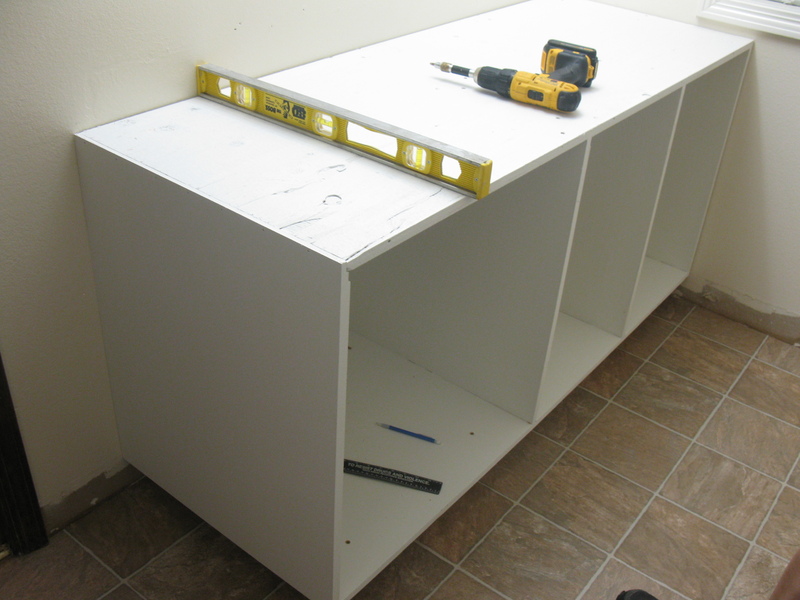 Once the cabinet structure was in place, we added the counter that we purchased. The counter was six-feet long so we used the table saw to shorten it to the length of our cabinet. We used a many-toothed blade to ensure a smooth cut on the counter and found that the attached backsplash made it difficult to keep the countertop steady as we pushed it through the table saw. With some creative thinking we made the cut happen. 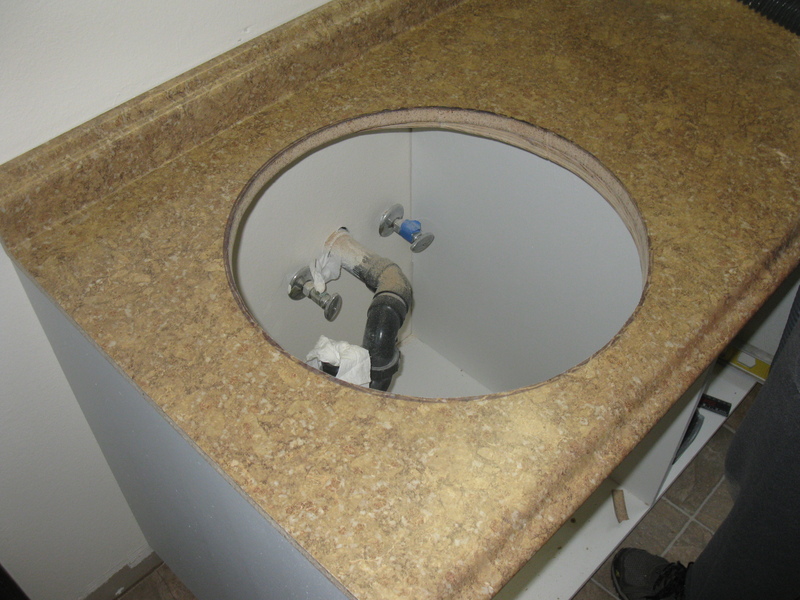 The following picture shows the counter installed and the sink hole marked. Now it was time to mark the sink hole and cut through the counter. The sink we purchased from Home Depot had a template enclosed with it. We tried to trace the template, but found it not as easy to make a good circular mark on the counter. 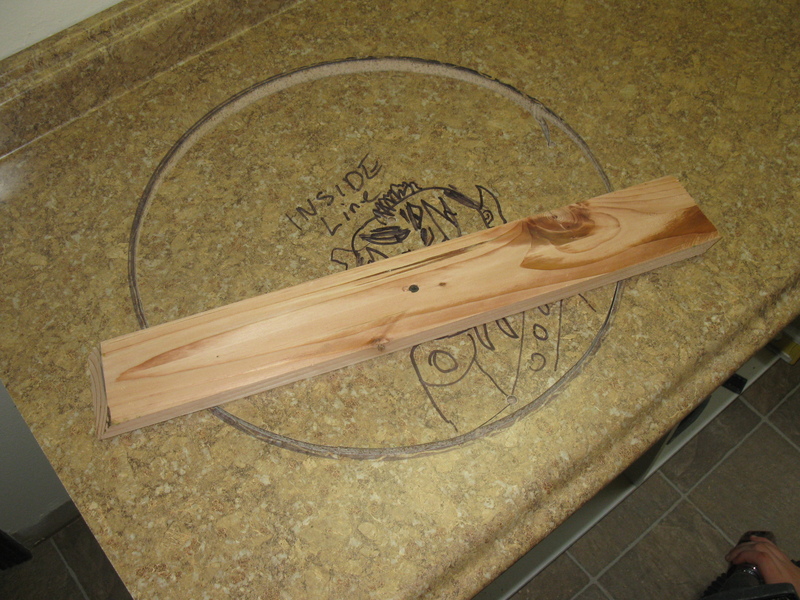 Instead, we used the template to cut a hole in the top of the sink cabinet. This cut did not need to be perfect. 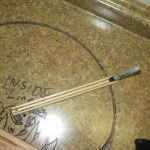 For the cut into the counter, we devised a wooden “compass” that we attached to the center of the sink circle and swung a marker around the edge of the “compass” to mark a more realistic circle. 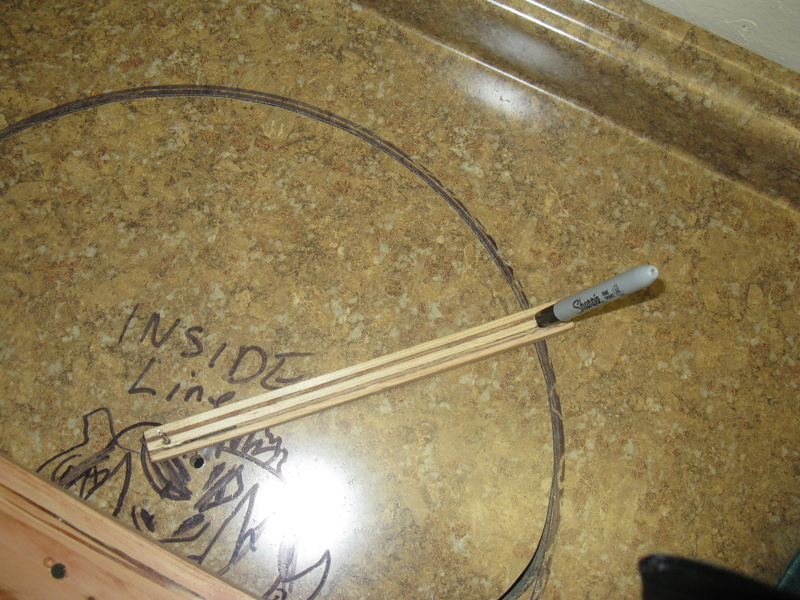 Then we drilled a hole on the inside edge of the circle that was big enough to fit our jigsaw blade into. 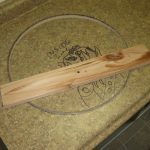 (Note: Make sure to test your jigsaw blade to ensure there won’t be tear out that would damage the counter as you are cutting the circle.) 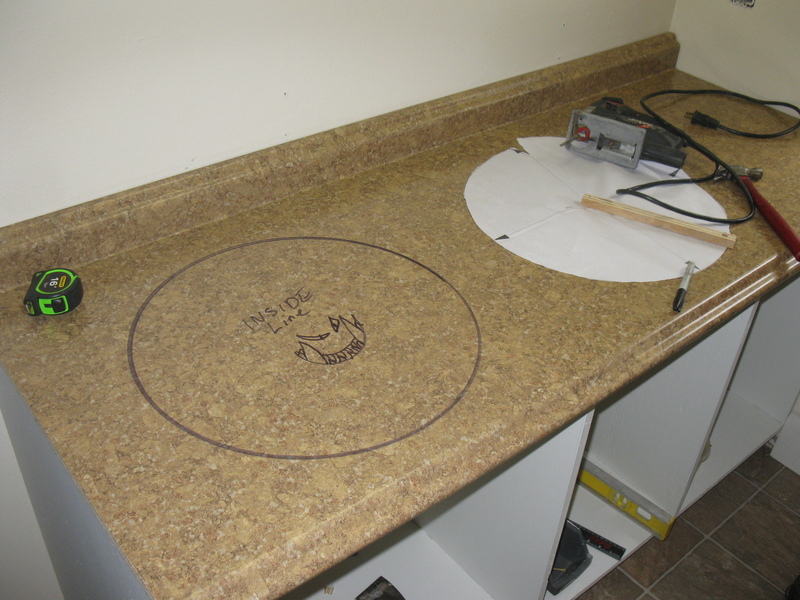 Next, we used the jigsaw to cut about 2/3 around the drawn circle on the counter. As we came to the last third of the circle, we attached a board across the circle to hold the weight of the circle so it would not tear away as we finished the cut out. See the pictures below for visuals of this process. Once the sink hole was finished, we glued the countertop to the sink cabinet with Liquid Nails and left that to dry a couple days before we installed the sink. 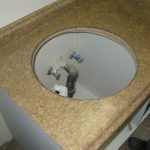 To install the sink, we glued it into the circle cut-out using Liquid Nails. Once the sink glue was dry, we could install the new faucet and caulk around the sink circle and the base of the faucet. We still need to install the doors and drawers to the sink cabinet. We also intend to build a narrow tower with three shelves that will extend up the right side of the counter and hold towels, medicine and electric toothbrushes. Look for an update to this post when we finish those jobs.